200 Proof Gospel.com: The God Must Be Crazy! It has been years since I have had an original thought, especially an original theological thought, which probably makes me a passable theologian. This post is no exception. It was Dr. Kevin Armbrust who got me off on this track and since he is a good theologian, I wonder from where he got the idea. 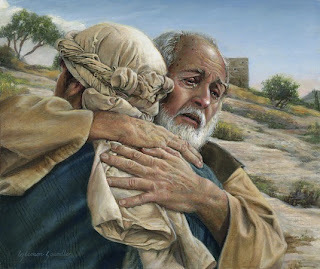 Ever since I have become a Lutheran, one of my all-time favorite texts to preach on is the Prodigal Son as found in Luke 15. One day, the youngest of two sons comes to his father and wishes him dead so that he could have his inheritance, RIGHT NOW! Now, many fathers would find this a good cause to kick the brat out and take him out of the will, if not smacking the kid a bit first, but not this father. Instead, this crazy old man liquidates half of everything that he owns, gives it to the son and wishes him well. There sits the father on the porch, day after day with his binoculars, just watching the road. The farm is being run by number one son, but he doesn’t care much for that. The old guy just sits and watches the road. Whenever anyone came down the road, he would stand up and say, “Is that him, is that him?” Day after day, week after week, he watches. Time after time, he’s disappointed, but he watches. This behavior is pathetic and well beneath the dignity of such a wealthy and prominent member of society. 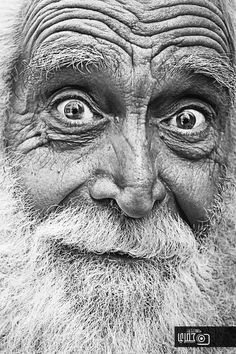 The crazy old man, lifts up his robes, exposing his legs (shameful in this day and age), and he runs down the road (also shameful, servants run, not dignified masters of estates). As he draws near, the boy started to mumble something, but he doesn’t care, MY SON IS ALIVE, HE WAS DEAD, BUT HE’S ALIVE! WHAT A DAY, WHAT A DAY! He embraces his son and through his tears, he calls out to the servants who had followed him, Quickly, get my best Armani robe and put it on my son, HE LIVES! To another, he yells, get my ring, the one that is a symbol of everything that I own and all of my authority, put it on the boy, HE LIVES! To another, he yells, kill the best animal we have and prepare a feast, MY SON IS ALIVE! Everyone at this point is staring at the crazy old man. This kid spat in your eye, squandered everything, wished you dead, comes home smelling like pig crap, and you’re giving him everything – AGAIN? ARE YOU CRAZY? Yes, God is that crazy, He’s wild, He’s nutty, and thanks be to God, he is crazy and nutty like this for you and me. In our sin, our self-serving idolatry, we constantly spit in our Father’s eye, we wish Him dead so that we could play god. We mock Him; we squander what he has entrusted into our hands and when we make a wreck of our lives when we return to His house with our heads hanging low (hopefully every week), He points us to the feast of the Lamb of God, who was slaughtered to cover our sins. God and the angels rejoice whenever we confess our sins and even before we can get the words out of our mouths, we find that we are clothed in the perfect robes of righteousness that we were presented in the waters of Holy Baptism, and here, the Father, the Son and the Holy Spirit rejoice and call out the insanely good words… “My son (you) was dead, BUT NOW HE LIVES!” With this, all of heaven and the whole Church rejoices. Another prodigal has come home... again and again. This is the life of the baptized, daily repenting and daily forgiven even before we can ask. God, by our standards, is crazy – THANKS BE TO GOD!